Forceville is a village some 10 kilometres north-west of Albert on the road to Doullens. 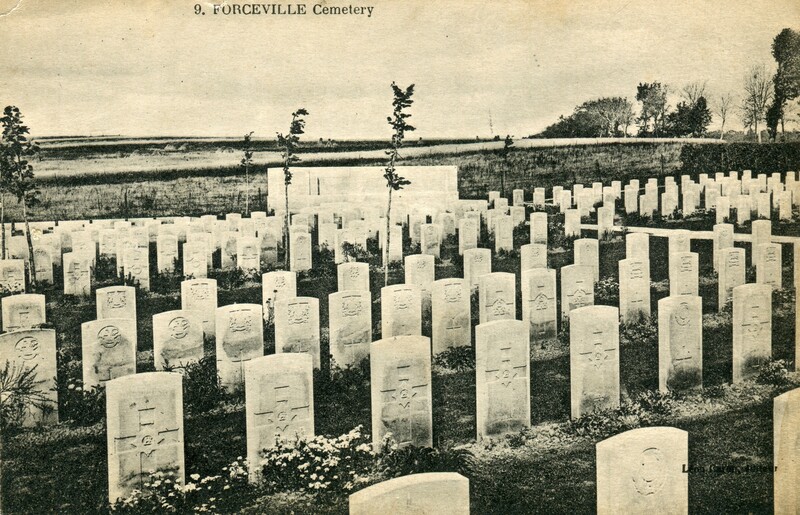 Forceville Communal Cemetery and Extension lies to the west of the village of Forceville, 20 kilometres from Doullens and 10 kilometres from Albert, on the D938, the main road between these two places. Commonwealth forces took over this section of the front line from the French in 1915 and in early August, land to the south of the communal cemetery was set aside for military graves. Field ambulances were stationed in the village from February to July 1916. Plot I of the extension contains the graves of men who died on the Somme front from September 1915 to June 1916. The graves in Plot II relate to the Somme offensive of July and August 1916 and those in Plot III to the operations of the autumn of 1916. In the spring of 1917, the front line moved to the east and it was not until the German advances of April 1918, which came to a halt just east of the cemetery, that further burials were made in Plot IV. There are now 304 Commonwealth burials of the First World War in this site, three of them in the communal cemetery adjoining the extension. The extension also contains seven German war graves. The cemetery extension, one of the first three Commission sites to be built after the First World war, was designed by Sir Reginald Blomfield. The Cemetery contains two unique graves; the original prototype headstones for the graves of Unknown Soldiers. The text on these was later simplified by Rudyard Kipling, as the cost of engraving so many headstones with this much text was too high.